I have searched for other photographs that may have been used by the designer of the PNG Rare Birds issue, and found most of them. I could not find one for the Slaty-backed Goshawk, and the image on the stamp is not like any illustrations I could find of the species. It looks more like a Eurasian Sparrowhawk (Accipiter nisus), but without finding the source photograph, I will list it as unidentified. The stamp titled "New Britain Goshawk (Accipiter princeps)" is based on this photograph of Grey Goshawk (Accipiter novaehollandiae). I have delayed publishing these observations for fear of causing the issue to be cancelled. The forthcoming issue of Rare Birds of Papua New Guinea has given us potentially 7 new species on stamps. However, realising that the image used for a Black Honey-buzzard was not as black as I would have expected, I searched for images of this species using Google. I soon found this photograph. 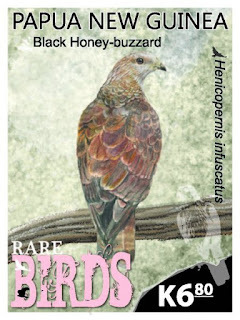 I suggest that the designer/artist used this image to portray a Black Honey-buzzard, but he was wrong. 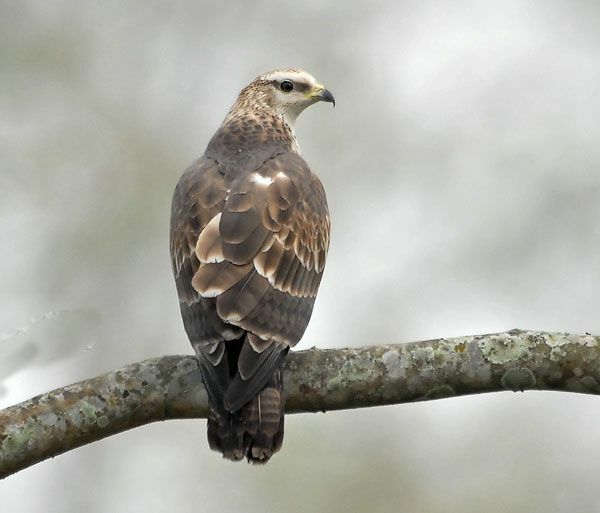 Using Google's image search of this particular photograph results in a suggestion by Google that the bird is an Oriental Honey-buzzard (Pernis ptilorhynchus). The photograph has been used in several places on the web, but perhaps the most authoritative was this one on Oriental Bird Images. This photograph was taken in January, 2009 at the Buxa Tiger Reserve, West Bengal, India, by Nikhil Devasar. One is reminded of a similar error from PNG when an image of the South American Harpy Eagle was used in 2008 to portray a New Guinea Eagle (Harpyopsis novaeguineae). In 2016, PCi produced for Samoa a 20-stamp set with the sub-title "National Geographic Animals of the World". Recently, several sales have appeared on Delcampe with the names of countries whose stamps are usually produced by IGPC. The images are not very clear, but the countries included so far are Ghana, Palau and Guyana. If and when these appear on IGPC's website, I will list them.